Few months ago my Cupcake (refer to about section to know more) came to India and brought some gorgeous make-up goodies for me. 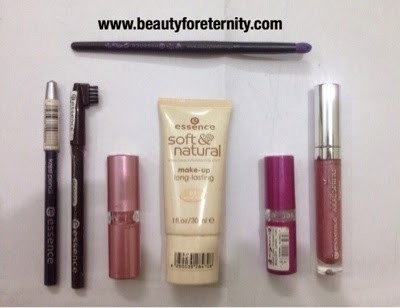 These were make-up products from the popular drugstore brand Essence which is There were face make-up, eye make-up and lips make-up products and I have been using all of those since then and loving most of them for their affordability and efficacy. Since this lovely make-up which is a German make-up brand is also launched in India, I thought of sharing this haul with mini review of each product on my blog too so that you can come to know about the products and can decide whether to buy or bash those. Essence Soft & Natural Long-Lasting Foundation : He bought this Foundation from 'Target' in Australia for around $8 for a 30 ml tube. This moisturising foundation I got is in the shade '03 Medium Beige'. It has got skin soothing linden wood extract and helps to achieve a fresh, even and natural looking complexion. It blends well and looks quite natural and skin like. It has semi-matte finish so ideal for oily skinned people. Essence Eyebrow Designer Pencil: This eye brow pencil was bought from 'Priceline' pharmacy for around $3 for 1 gram during a sale. It is in the shade '02 Brown'. It comes with a cap which has got a brush on it. It is an ideal shade to fill in the eyebrows for people who have dark but sparse eyebrows. It is quite pigmented and does not smudge easily. You have to use it with a light hand in order to achieve natural looking fuller eyebrows. Essence Kajal Pencil: He bought this Kajal pencil again from 'Target' for around $3. This is in the shade '21 Feel the Eclipse'. It is a wooden pencil which needs to be sharpened and comes with a tight cap. I am not a fan of this as it is too soft for my liking and within an hour or so it smudges and gives me panda eyes. Essence Lipstick: This Lipstick was bought again from 'Priceline' for $4 during a sale. This is in the shade 'No 12 Sparkling Miracle'. It has got fine shimmer particles to it. I used to like these kind of shimmery and frosty shades of lipsticks when I was a teenager and did not know much about makeup .. However I don't really like such shimmery lipsticks. This particular one by Essence is not so pigmented and does not look good on my lips. Essence Lipstick: Another lipstick shade that I got is 'No 60, Cutie Mac Cute'. This was bought from the same 'Priceline' store for $4. This is also a shimmery lipstick. Essence XXXL Shine Lipgloss: I need to check the price of this lipgloss. I have not used it yet. I will do a detailed review post on it very soon. Keep checking my blog to stay updated. Essence Smoky Eye Brush: I also got a smoky eye brush from the same 'Priceline' store in Australia for $3. It is an awesome brush and I have used it to create so many eye make up looks in these few months. I will do a detailed review post on this brush. So this was my first 'make-up shopping haul' post featuring make-up products from the brand Essence. However this is not the last post because I have got tons of other make-up products from the same brand which are at my in-laws place right now and I will soon cover those all in new haul and review posts. Make sure to follow my blog to know more about this brand.